“Cloths of Heaven”. Seb Lester’s Calligraphic Masterpiece. There was a time not to long ago when people actually had good hand writing. Taught in primary school, practiced for hours, good penmanship was king. Slowly though, over the last twenty or so years it has begun to dissolve. Why write by hand? Why write in cursive? Why practice the art of creating letterforms by hand when you can type, touch or talk, and have your primary communication device correct your spelling on the fly. Don’t get me wrong I am not anti-technology. I am however in love with beautifully crafted hand lettering that demonstrates the craft of a dying art form. Thanks to people like lettering artist Seb Lester the art form stays alive and well. Hopefully his work will encourage others to take up a pen and create with ink on paper. 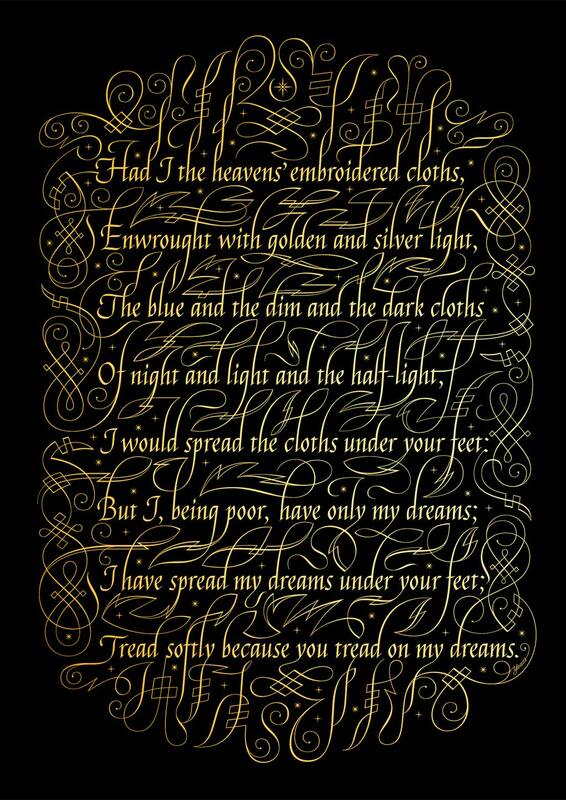 Cloths of Heaven’ is Lester’s interpretation of “Aedh Wishes for the Cloths of Heaven”, by renowned Irish poet William Butler Yeats. The video shows the creation of a the master art for a serigraph poster, which was also translated into a limited edition embroidery piece via The London Embroidery Studio. The attention to detail, and the craftsmanship that went into this is outstanding. It is a continuation of his exploration of the theme of beauty in the context of letterform design, and the mastery of the calligraphic arts. Big hat tip to Seb Lester. ← 84000 Words of the Buddha. Have you taken a look at your handwriting recently? Or for that matter that of your children? How many generations are we away from losing the noble art of beautiful handwriting. Leave the keyboard alone for a moment and pen something to someone you care about. And post it. Designing in 3D. Helen Yentus Book Cover for "On Such a Full Sea".